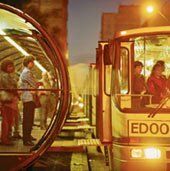 Today I read an interesting article in a recent Sierra Club Magazine about the implementation of Bus Rapid Transit, BRT, in Curitiba, a city in Brazil. BRT seems like an excellent alternative to subways and light rail which are much more expensive. The idea is to give buses their own dedicated lanes in the centers of major streets and to make sure they stop less frequently, about every third of a mile instead of every block. Special ramps can also be installed to make boarding much easier and quicker. A city like Los Angeles which has many long and wide streets should be able to implement systems like this.